Yashna Maya Padamsee is someone who you may have connected with in her other role as a moderator of national online conversations about health, social justice and sustainability. Yashna is a first generation south asian immigrant queer femme who was raised in part by the US South. She learned yoga as a child from her maternal grandparents and did her formal training with the Sivananda Yoga Ashram and Tricia Mickelberry. Yashna has blessed to have the chance to teach and share yoga since 2001. Currently she works with love and care for the National Domestic Workers Alliance as an Administrative and Events Coordinator. A post on yoga, law, and nation building, by Roopa Singh. In a recent Southern California lawsuit, Sedlock vs. Baird, the relationship between yoga and religion took center stage as parents fought to keep yoga in public schools. A mother and father were uncomfortable with their child coming home from school knowing Sanskrit names for asanas; they were unsettled by the idea of sun salutations and the potential connection to spirit. In response to the lawsuit that ensued, hundreds of Encinitas families came together to advocate for yoga to stay in their public schools. On July 1, the decision was made to keep yoga in public schools, a decision that stated yoga does not endorse or inhibit religion. One one hand, I am delighted that yoga was kept in American public schools, primarily because of how needed it is in the lives of children. On the other hand, I am concerned about the need to sever yoga from all signs of coming from South Asia so as to fully integrate into American society. The successful defense team rested their argument on the assertion that yoga is now more American than it is Indian, a practice “as secular as aerobics.” Towards keeping yoga in their schools, “possibly religious” elements of the yoga offerings were stripped away by school workers, including any reference to Sanskrit. It is important to take time to begin to tease out nuances here, around the relationship of yoga to religion, because this legal language is now codified and will be relied upon as precedent for the entire future trajectory of yoga in America. What are the assumptions underlying the statement that yoga is now more American than it is Indian? That to be Indian tends towards the religious, or is more tied to spirituality. That yoga, in the sliver of time that it has existed in America, could be severed from the culture that created and sustained it for at least 4000 years. That there is a choice to be made between being American and being Indian, that one entity simply cannot be both, and that the agency behind this choice can rest exclusively in the hands of Americans. So tightly does America hold on to the flawed narrative that ties being American with being white. In the 1920’s, a U.S. Supreme Court case ousted an outspoken Indian man named Bhagat Singh Thind from the country, probably for his political work, but technically because Indian’s could not be considered white for the purposes of becoming American citizens. That was then and this is now, but now is not so different. Can a person or an entity like yoga, be Indian and still be American? Many of us have the lived experience of being both Indian and American, and exemplify the way yoga can be both. Growing up in an open minded, progressive Hindu household, I was consistently taught that Hinduism was expansive enough to allow for all religions to be respected, imbued with enough wisdom to exist as polytheistic and monotheistic, and that therefore no choice had to be made between being Hindu and being anything else. This is a drastically different religious and spiritual ideology than many Christians are used to. Christianity, which generally draws clear lines around inclusion and exclusion, is responsible for shaping the American idea of “religion.” The fact is, relationships between yoga, religion, and spirituality are complex, and certainly not able to be reduced to a “Yes, yoga is religious,” or “No, yoga is not religious,” stance. It is unfortunate that the race to protect the existence of yoga in American public schools created the need for an argument that requires a severing of cultural ties in exchange for integration. A more deeply nuanced discussion might focus on the reality of American, or Christian American, discomfort with the power of yoga, the power of South Asian cultural production, and South Asians in general. An in-depth look at the issue might reveal deep seated discomfort rooted in fear. Fear of losing hold on an American identity that never truly was, experienced now as a frantic ownership over being “American.” To a large extent, America has always required a severing of cultural ties in exchange for being America. Think of the flood of European immigrants severing cultural ties for blanket constructions of American whiteness. Perhaps the forced abandonment of home propels this same population, generations later, to continuously run to yoga and India as a kind of home; for spirit, mind and body. In the running to India, it is not a stretch to assume that the dysfunction would continue, that those oppressed would then oppress. It make sense that the American practice that required origins to be stifled even as bodies were used (the whitewashing at Ellis Island, the blackwashing at Southern plantations) is being enacted now with yoga as a body, not a human body but a body of cultural and theological production. It is so poignant, the way many white and black practitioners of yoga adopt an Indian identity, often in stark brown face. Poignant and delicate, because adopting a new home before coming to terms with ones home of origin is an adaptation or appropriation fraught with fear. Fear breeds violence. Arguably, the association of India with cosmic spirituality and new-agey religious practices is mainly an unfortunate by-product of spiritual tourism, a new kind of occupation. Occupation, like all forms of violence, operates on extremes, swerving between two polar opposites of love and hate. Love yoga, but hate South Asians; we cannot run from the extent to which this is the moment in time we are in as Americans. We practice asanas and launch drones into Pakistan. We fuel a high end yoga fashion industry, loving our Lululemon, and supporting the exponential continuation of Triangle Factory style disasters in Bangladesh. We love the one Indian doctor on our fav hospital show, while hate crimes and shootings continue on Hindu temples, Patel Brothers grocery stores and South Asian cab drivers. We idolize spiritual South Asians like Deepak Chopra but effectively weed out all but the most right wing South Asian elected officials. The science of yoga was created with balance in mind, to help humans be unswayed by tides of these types of extremes, balanced in the fray of life. As it stands, yoga is American, but Indians are not generally perceived as American. It is said that a mansion cannot be built on sand. If fear underlies yoga, the hints of this lack of mindfulness are necessarily affecting the impact of yoga in America. For example, there is a troubling exclusivity to yoga offerings in America. In a two year archival study of leading health and wellness magazine, the Yoga Journal, there was never a South Asian person on the cover, and less than 1% of content contributors were South Asian. Out of four Yoga Journal conferences in the 2013-2014 cycle, only four presenters are South Asian, and only one of those a South Asian woman. Yoga is largely associated with wealth, whiteness, a connection to elitism and American exceptionalism that means so many folks who really need yoga because they lack access to health care, truly believe yoga is not for them. Yoga is for everyone and should be offered that way, to foster inclusivity. Another example of the unskillfulness can be found in the rising tide of “yoga injuries” experienced as more yoga classes emphasize the outer look of a pose over the inner experience of the body. Yoga and injury are two words that just do not go together, and yet in the American yoga industry, the yoga injury is a real and rising phenomenon. The lack of embodiment which leads to injury and the exclusivity of yoga are both antithetical to the science of yog, and both highlight a troubling of otherwise healing waters, ripple effects from appropriation. Yoga is South Asian and American, and serves so well as a nation builder in America, and the world over, precisely because it creates and strengthens universality from the inside out. When the integration engendered by yoga is not reflected externally by the integration of South Asians in what it means to be American, there is a disservice being done to yoga and all who do it, period. I am thrilled that the court allowed yoga to remain in public schools in Encinitas, that is good precedent for the rest of the country. Also, I hope yoga can re-ground in its cultural roots as it becomes more American, and I aim for all people to have access to yoga that is embodied and accessible. Roopa Singh, Esq., is the founder of SAAPYA and a business owner of Brooklyn based health and wellness center, Third Root. 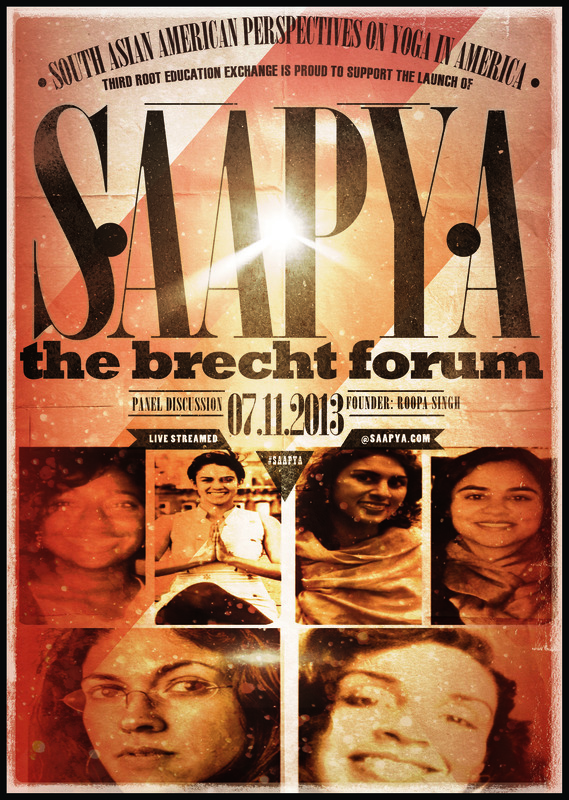 SAAPYA provides a platform for South Asian American voices in yoga, cultural awareness in yoga trainings, and a network of South Asian American practitioners of yoga.